It takes a village – not to raise a child, in this case – but to build a home. 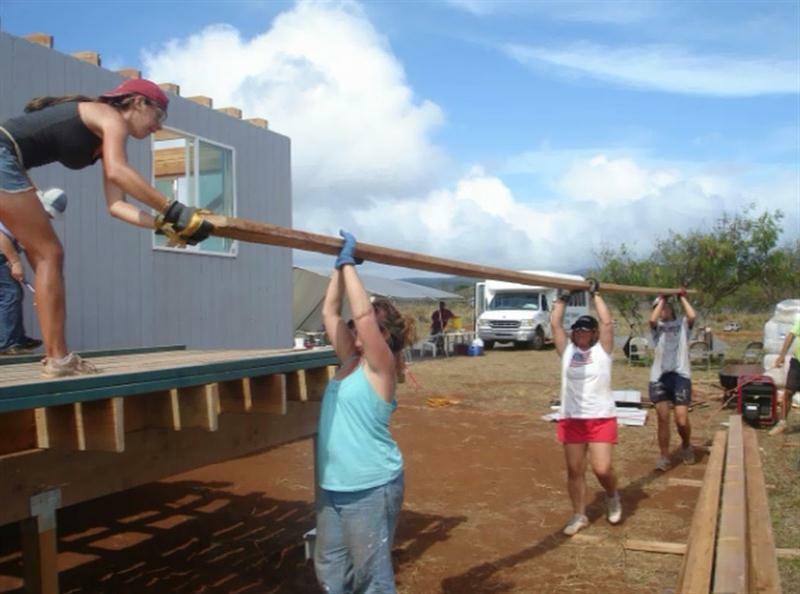 Molokai Habitat for Humanity’s latest project brought 15 volunteers hailing from the mainland to Ho`olehua as a part of Habitat’s Global Village program. The team was here for 10 days and left early last week, after making substantial headway for a home currently being built for the Kaai `ohana. It is expected to be completed in two months. Global Village takes people from around the world who want to make a difference in the lives of poverty-stricken families by helping build and restore homes. The program’s ultimate goal is to help end homelessness and create affordable housing. Noordhoek herself will be embarking on a Global Village trip to Egypt in October to build houses in rural areas. After eight-hour days of hammering, drilling and sawing, the volunteers also found the time to delve into Molokai’s distinct culture by learning hula, hiking through Halawa Valley, canoe paddling and talking story with community members who opened their homes. Kalele Bookstore even hosted a movie night featuring Matt Yamashita’s videos as well as a talk story with Yamashita and Malia Atuagawa on the island’s current issues. During last week’s mahalo party for the group, Black stood up in tears, thanking the community for the love and hospitality. “Molokai will always hold a special place in my heart,” she said. “To be able to work this close with such a special family was the most amazing part,” she said. Noordhoek said the team exceeded its goal, completing the construction of the walls, siding and frame of the house. Molokai’s Habitat for Humanity division has offered to take in Global Village teams every six to eight weeks to gain speed with its efforts. The next team is expected to arrive in December, with two more teams scheduled for the beginning of next year. Habitat for Humanity is a national nonprofit organization whose mission is to build affordable homes for low-income families around the world. Molokai became an affiliate in 1998 and is the only branch to serve poverty-stricken families on the island. Last winter, Noordhoek met with state Senator Dan Inouye through an advocacy conference in Washington, D.C., and requested funds for the habitat program. As a result of the meeting, Inouye allocated $400,000 for Molokai Habitat affordable housing projects this year. “This money will go a long way to help us build homes,” she said.